Preheat the oven to 350°F. Beat together the eggs, sugar, oil, 1 cup pumpkin puree , yogurt, vanilla extract. Whisk together in a large bowl flour, baking powder, baking soda and spices. Add the flour to the egg mixture and mix until well combined. Pour the batter into a greased and floured 9-inch round pan. Bake it for about 30 min, or until toothpick inserted in centers comes out clean. Cool it in pan for about 10 min then remove it from pan to a wire rack to cool completely. In a bowl, using an electric mixer beat the cream cheese until creamy. Add sugar, pumpkin puree and spices and mix well. Gently stir in whipped cream. Take apart 1/3 of the filling. In a pan melt 1 cup of dark chocolate and add the third part of the filling. Cool the fillings in the fridge until using. From water, sugar and almond extract make a syrup on a medium heat and let it cooling down at room temperature. 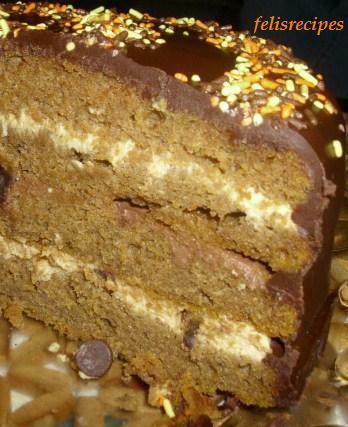 Cut the cake in 3 layers with a serrated knife and pour with a tablespoon the syrup on each layer. Start spreading cream cheese filling between layers. Do not frost the top layer. 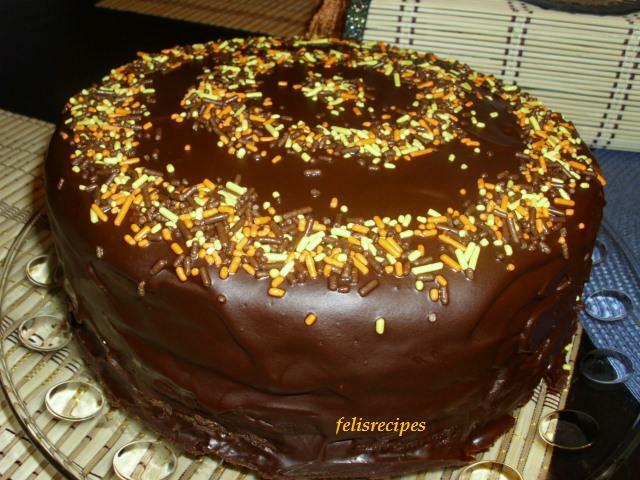 Cover the cake with an icing made from melted chocolate chips, sugar and sweet cream. Drizzle with colorful sprinkles.